Han Dong-woo, former vice chairman of Shinhan Life Insurance Co. was named chairman of Shinhan Financial Group by the Selection Committee of the Chairman, the committee announced on Feb. 15. The chairman nominee said he will not name a president of the financial group for the time being until he sees what the key focus of his management of the group will be when his appointment becomes official at the shareholders and board of directors meetings next month. He said, however, since he is a career Shinhan man and knows the group well, he doesn’t think the group needs a president, unlike in a case where the new chairman comes from outside the group. The special committee changed the regulation on group management, changing the structure in which the chairman and the bank CEO co-managed the bank to giving the entire responsibility to the chairman in a move to prevent the further heating of the international conflict among top executives of the group that developed in December last year. Han said the chairman should alone take full charge of running the group, including the bank. The new chairman nominee also said he is heartbroken from the fact that three top executives of the group, Ra Ung-chan, Shin Sang-hoon and Lee Baek-soon have decided to leave the group, taking responsibility for their departure. Han praised their decision to resign as a move to give the group a brand new start, wrapping up the entire aftermath of the incident. He also said he would seek the advice of Korean residents in Japan who hold large stakes in the group, especially in the bank, as they think the organization is more important than any other thing in running the group. The new chairman also has to heal the wounds inflicted by the internal feud among the three top leaders of the group, as they will no longer be with the organization. He would have to make amends with those who used to be on the side of former President Shin, as he is considered to have had the support of former Chairman Ra, and during the process recover the public confidence in the bank. The former top three leaders were engaged in feuding over charges of Shin’s alleged misconduct, which also hurt the bank’s employees’ respect for the bank, quoting banking industry sources. “I will try to have them recover confidence in the bank and embrace all employees as if they are brothers and sisters as a senior officer should,” Han said. The financial sources said Han will not be able to shake up the organization as much as he would like to because high-level personnel changes were already made before his arrival. He will have to move slowly to break down the walls that divided the sides of the Ra, Shin and Lee feud. The new chairman will also have to mend fences with shareholders in Japan who sided with other candidates during the process of nomination. Han said he knew their fathers very well and is ready to inherit the founding philosophies of Shinhan Bank. Some, however, speculate that Han might move to reduce the influence of those close to the shareholders in Japan in the group’s management. He told reporters following his nomination that he wants to make the group truly global by attracting foreign capital from advanced countries, which was taken as meaning that he will try to lure foreign investors like BNP-Paribas during his term of office. Han might either replace outside Director Chung Haeng-nam, who is a Korean resident in Japan whose term is up, with a domestic person or expand the members of the board of directors to 15 from the current 12 to gradually reduce the power of Korean resident shareholders in Japan. 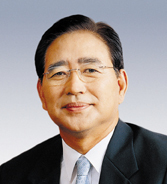 Chairman Han Dong-woo of Shinhan Financial Group, who was named recently to succeed former chairman Ra Ung-chan.